At this year's Banff Mountain Book Festival, one of the highlights was an interview with Dervla Murphy, the Irish travel writer who cycled from Britain to India in 1963. A wise, independent spirit at a time many Western women were in Betty Crocker mode, she wrote the book Full Tilt about her adventure. It's out of print in North America, so I ordered a copy from England. Although she's written lots of other books, I was especially interested in this one, which she apparently compiled directly from her journal notes. I keep lots of notes during my travels -- I average about an hour writing a day, which is not always easy at the end of 8 or 12 hours of sledding or kayaking or whatever. I use the notes as reminders and draw on the occasional one-liners or insights, but I never lean on the notes too heavily. If I transcribe huge passages, even good ones, verbatim, the narrative loses its flow. But Murphy's notes were so good and well-structured that they could stand alone, preserving the immediacy of the experience while still having a literary shape. As with all good travelers, her spirit shows through best during the worst experiences. A couple of early attempted rapes read almost humorously: "As my adversary was armed with a revolver I kept my gun in my pocket and used unprintable tactics to reduce him to a state of temporary agony." Then she bolted, taking his pants with her. Pure joy is one of the rarest of all emotions, yet I've experienced it several times traveling in the Arctic. I suppose it's the combination of a physical life and the place's overpowering beauty. Joy transports you to a different place. You never forget the times it washes over you. Joy is so rare, fleeting and intense that it is very difficult to convey; I know of only two successful expressions of it in art: the Ode to Joy passage in Beethoven's 9th Symphony and Arthur Rimbaud's prose poem, Morning of Drunkenness. If there are others, I wish someone would point me to them. This unsuccessful entree to a piece made me recall a wise bit of writing advice from an old editor of mine, the late Teddi Brown: "Quote leads went out with hoop skirts." Once in a while, it's fun to look at the countries that spend time on this site and wonder what on earth they're finding here. Today, example. Greenland, sure. But Iran? Israel? Amusing to consider that the few minutes they spend here may be one of the positive things they have in common. Deep down, we're all polar. For those who think digital rights make book and photo royalties complicated, get a load of the byzantine nature of the new music business in this Rolling Stone story. Journalists love an anniversary. It's the simplest sort of hook. A hook is what editors ask for when you propose a story. It's supposed to answer the question, "Why do this piece now?" If something happened any nice round number of years ago -- 10, 25, 75, 150 -- it's an excuse for a story. If Lincoln was born 200 years ago today, then write about Honest Abe. Expeditioners do the same thing, trying to drum up interest by timing their project with the anniversary of a famous precedent. This year, it's the centenary of Amundsen and Scott's race to the South Pole, and many expeditions are doing the obligatory "In the Footsteps of". It'll be almost busy down there. One of my failings as a journalist is that I've never been big on anniversaries. Maybe it's my background in mathematics. Our number system happens to use base 10, but there is nothing intrinsically more significant about 10 or 100 than, say, 14 or 37. A hook has its uses. It leaves the reader with something meaty and succinct to take away at the end of a piece. It's like the moral at the end of an Aesop's fable. But the question, "Why do this piece now?" has always made me uncomfortable, because my real answer is often, "Because it's a fascinating topic that hasn't been done before." In this case, however, the truth doesn't win any assignments, so I make my pitch armed with a hook. Anniversaries excluded. One of my favorite quotes comes from Rebecca Solnit's classic book about walking, Wanderlust. Although I didn't use it as a heading quote on either of my books -- it's not a writer's job to interpret his own stuff -- it's one of those lines I identify with. 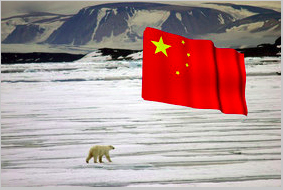 A recent article on China's interest in the Arctic includes a shot of a polar bear on the sea ice against some icy mountains. Although it's hard to judge from so small a photo, the relative size of the bear and the mountains suggests to me that one of them has been Photoshopped in. It reminded me of the first polar bear "sandwich" in the history of photography. In 1869, artist William Bradford went on a cruise to Greenland with two Boston studio photographers, who were there to take reference shots for him. 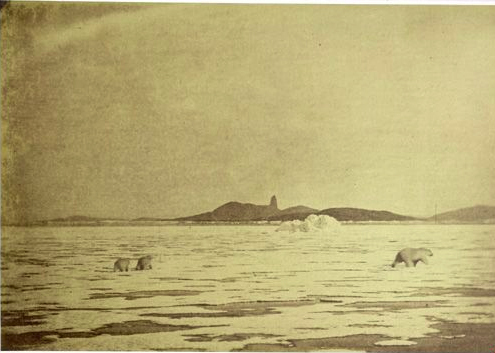 Bradford's The Arctic Regions became the first arctic photo book. This beautiful work includes one shot of some polar bears that have clearly been stripped into the scene in the darkroom. The deception is obvious in the full-sized image, which I've seen. Over a century before Photoshop, photographers were manipulating reality and not admitting it. A sobering piece on the future of being a professional writer in the digital age. Today's Globe and Mail has a slideshow of my arctic imagery. An accompanying editorial page piece will be following shortly. Picked up a Silver at the National Magazine Awards on Friday for a photo piece I did for explore magazine. Full credit to the editor, James Little: He's always known how to edit and package an article in a way that wins at these competitions. 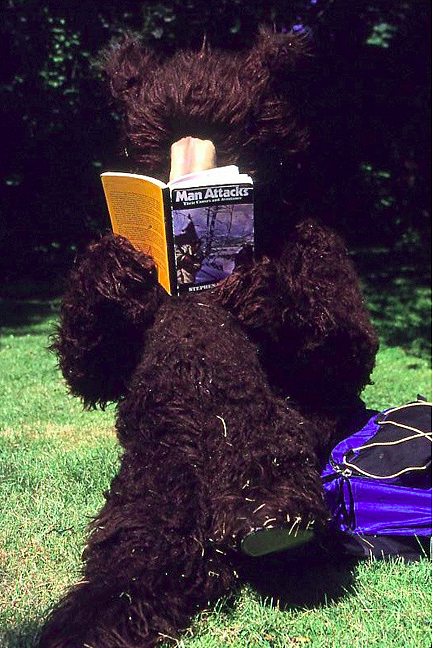 Here he is early in his career, dressed in a bear suit and affecting to be a bruin concerned about human attacks, when we both worked as editors at Outdoor Canada magazine. This photo sequence did not win any awards. 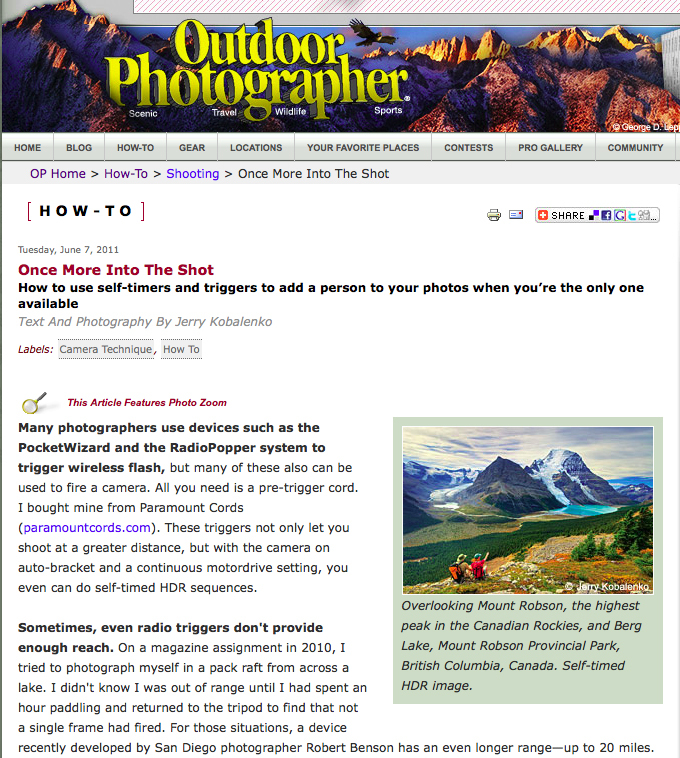 A story of mine on the art of self-timed expedition imagery is in the current issue of Outdoor Photographer. Excerpt below. Click on the link for the full story. When I began to write, I had just finished university, where people wrote in ways that seemed designed to be as clunky and unclear as possible. Using big Latin-based words sounded as if you were an objective scholar who knew what he was saying. In fact, university writing often perverts language to such an extent that you can never write clearly again. I saw it time and again as an editor, when manuscripts came over the transom. You could see at a glance the ones who had been through university and failed to shake off the experience. 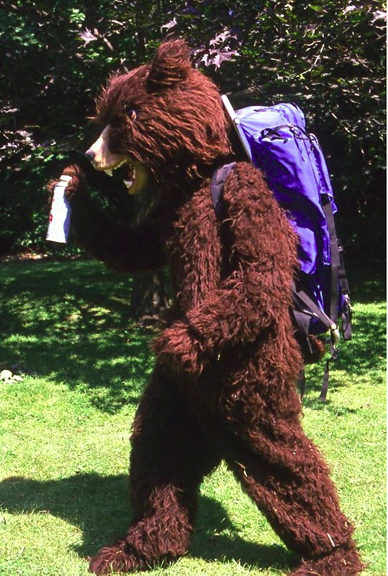 Although Shakespeare was the bane of my high school English class, I never forgot some of his lines -- everything from the quatrain beginning, "The weight of this sad time we must obey," to the immortal stage direction, "Exeunt, pursued by a bear." After university, I began to re-read him voluntarily for some reason. One day, I "got" Shakespeare. I was trying to figure out King Lear, and the more I thought about the play, the more onion layers there seemed. It was clear that you could never get to the bottom of one of this guy's works. You could interpret in many ways, but the kernel would remain forever elusive, and that was okay. That's how it was supposed to be. This is a "Duh" realization to any good reader, but at the time, I'm afraid, it was new to me. The language that had seemed so opaque in high school was now transparent. Without trying to, I had learned to speak Shakespearean; not well, perhaps, but enough to get a sense of the depths. It was incredible how he could express so much, so well, in so few words. I was reminded of this the other night when Alexandra and I watched the old film, Runaway Train, for the first time. It was in some ways like Speed, but with Jon Voigt playing a deeper character than the sort who populates action films today. It ended with a quote from Richard III. The line flows past so quickly, it's as if Shakespeare just tossed it off: "No beast so fierce but knows some touch of pity. But I know none, and therefore am no beast." An instructional piece on photography that I wrote last year for explore magazine, called Shoot Like a Pro, earned a couple of National Magazine Award nominations today. 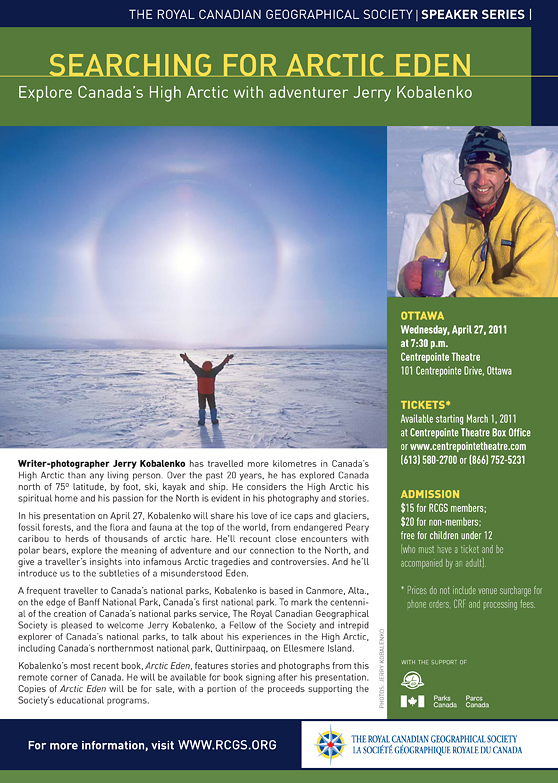 Gave the talk below to about 600 people in Ottawa. Good crowd. Good questions at the end, too. The following day, paid my respects once again to legendary RCMP officer Alfred Herbert Joy, one of the true heroes of arctic exploration, who is buried at the Notre Dame Cemetery in Ottawa. Met with the editorial board of the Globe and Mail in Toronto yesterday to discuss the Arctic. Guess they must have needed some light relief: These fellows usually meet with the President of Mexico, Bill Gates, those types. Earlier this week, they had discussed politics with Margaret Atwood, Jack Layton and Michael Ignatieff. What was I doing there? Trying to give a different perspective on the Arctic, I suppose. They taped the presentation and will be turning it into a podcast. The new issue of Outdoor Photography Canada has a profile of my arctic travels and imagery. The article itself is not online but a sidebar to the main piece is available here. Late last year, the Ryerson Review of Journalism published an excellent article on the realities of writing non-fiction books in Canada. It's from the perspective of magazine writers who enjoy the almost-dead art of long-form journalism. Books, the article suggests, satisfy the need to write in depth but give even less financial reward than magazines. It's worth reading; the numbers are pretty accurate. The one missing figure is that experienced writers can often add $20,000 or more to their modest publisher's advance from Canada Council grants and similar, though smaller, provincial monies. If you write quickly and can crank out a book in a year or so, it's possible to make a living. Books published in the U.S. often get higher advances, but American writers don't have that grant system. Incidentally, Canadian publishers often publish Canadian books simply because they also get grants to do so, not because they think that the book will make them anything or even break even. This is more the business of photography than writing, but here's one reason why photo prices have tanked in the last couple of years: Since everyone has a camera in their cellphones, news organizations that used to pay for imagery now solicit it for free. And they get it. Here's The New York Times's request for reader photos of today's earthquake in Japan. Note the little rights postscript at the bottom of the page: "You are agreeing that we can use your submission in all manner and media of The New York Times and that we shall have the right to authorize third parties to do so." In other words, they can give (or sell) your image to third parties and you won't get a cent. I'm usually not a fan of southern writers who travel the polar regions a little and then write pop books of their impressions. Often the results simply parrot all the usual sentiments of the day. While I loved Gretel Ehrlich's wise, poetic memoir set in her home state of Wyoming (The Solace of Open Spaces), her arctic books offered little of interest. This Cold Heaven, for example, reminded me of someone who hung around Canmore for a while, then Banff, then Jasper, did a few day hikes with locals and a couple of long-weekend backpacking trips, then wrote a book about the Rockies. Far better to stick with the modern classic of that region, Jean Malaurie's The Last Kings of Thule. Of course, you don't have to be a resident to write about a place; travel writing has its merits. Nor do you have to trudge 10,000 km, as I have, before you can presume to say boo about the land. Sara Wheeler's Terra Incognita: Travels in Antarctica was a great read. And based on the excerpt of her latest book in Slate, so is The Magnetic North. I'm currently peer reviewing a manuscript about arctic history for a university press. It's a bit of a departure for me -- I'm a traveler/writer/photographer, not an historian. But most arctic historians do not have a degree in history. William Barr comes from a geography background; Kenn Harper is a businessman; Robert Bryce, a retired librarian; Len Guttridge was a writer; so is Ken McGoogan. Arctic historians tend to be self-educated in their field, through a lot of reading and visiting archives. The book I'm reviewing is not specifically about the North Pole, but it does graze on it. It also follows a sloppy principle that I've noticed in many contemporary arctic books: a noncommital attitude to whether Cook or especially Peary reached the Pole. These books acknowledge the controversy, but do not come down on one side or the other. That's not because there isn't a clear answer: it's been pretty obvious for years that neither Cook nor Peary got anywhere near the North Pole. But taking a stand requires far more research. It's easier to ride the fence, as if the matter is still wide open. Worldhum.com is an excellent online literary travel magazine, the best I know. How they manage to put out something of this quality I don't know, because the last I checked, they paid 10 or 20 cents a word -- a fraction of what good magazine writers usually earn. It must be like those literary fiction magazines, where the writer writes mainly to be published, not to be paid. We writers all do that sometimes, with labors of love. Anyway, there are clearly a lot of talented people out there, including many who don't feel the need to make writing their life. Talent and fire in the belly are different entities. Read this good piece tonight from Worldhum's archive, about a guy who had the chance to visit the super-remote Russian base Vostok in Antarctica. Another shoestring but quality production is the aptly named Dirtbag Diaries podcast. Earlier this week, a friend convinced me of the benefits of joining Facebook. So I did. Nineteenth century British explorer Richard Francis Burton used to dash off his two-volume travel tomes in the brief hiatus between journeys. Although I love his books and have read them all, he is a frustrating literary companion. He makes no effort to write tightly or interestingly. He is a fact omnivore, gobbling up every tidbit about a place and then disgorging them helter-skelter in his books. If he can't wrest a fact into the narrative, he tacks it on as a footnote. "In taking leave of the gentle or ungentle reader, I may be allowed to remark that amidst an abundance of greater there is undoubtedly a crowd of minor blemishes, which those charitably disposed will attribute to a 'single revise'." In other words, he couldn't be bothered spending the time to get it right! A chapter in another book was so unutterably dull that it bored even Burton. He ended it, abruptly and hilariously, with the line, "I now conclude this unpopular chapter." "[Jackals] half-torpid after their ravenous repast, creep out of their dirty dining room in the corpse's stomach." "Boulder clouds surged up from west and south, hiding the hills with hangings of rain sheet." [There were] "365 passengers, of whom 86 were at an age delightful only to their mammas." This is a guy, remember, writing in the 1850s. "He is prognathous and dolicho-kephalic, with retreating forehead, more scalp than face; calfless, cucumber-shinned, lark-heeled, with large broad and flat feet; his smell is rank, his hair crisp...and his pile like peppercorns. His intellect weak, morale deficient, amiability strong, temperament enduring, destructiveness highly developed, and sensibility to pain comparatively blunt." Burton was one of the great linguists of any era and was said to speak 29 languages fluently. He makes some lists of the world's most accomplished polyglots. Not all writers love words; many just use them. Burton loved words. English, Aramaic, it didn't matter. Words. 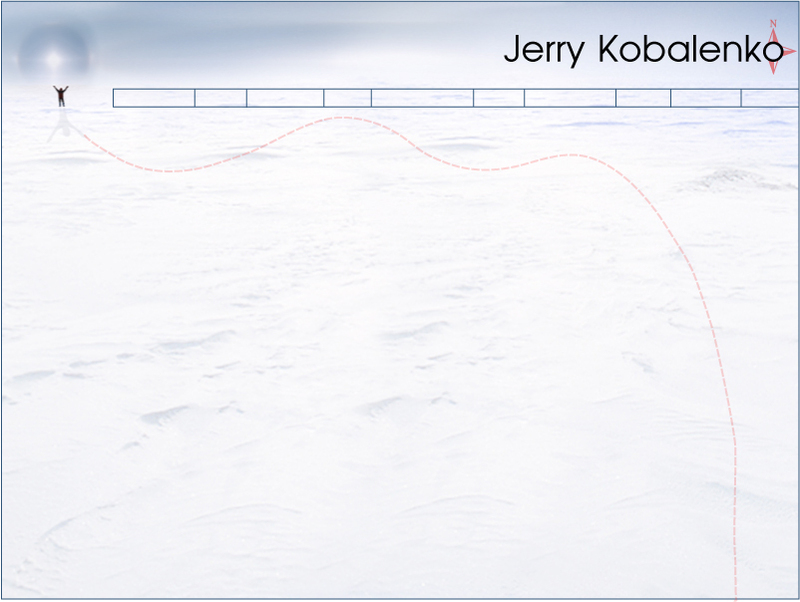 All words and images ©2008-12 Jerry Kobalenko. Unauthorized use strictly prohibited by law.